On a recent visit to Robert Filiou: The Institute of Endless Possibilities at the Henry Moore Institute, I stood for a long time in front of an odd little object, or rather an odd little collection of objects. At its center was a plank of blonde wood set on hooks as though a module in a much bigger accumulation, with three diminutive boxes containing a small red sock, an even smaller red sock, and a tacked piece of paper with its title, Création permanente, scribbled on it. I did not come into the exhibition with much knowledge of Filliou or his work, and neither is my concern here. My reaction to this object was not academic, but felt personal, intimate even, and certainly without regard for any artistic intent. 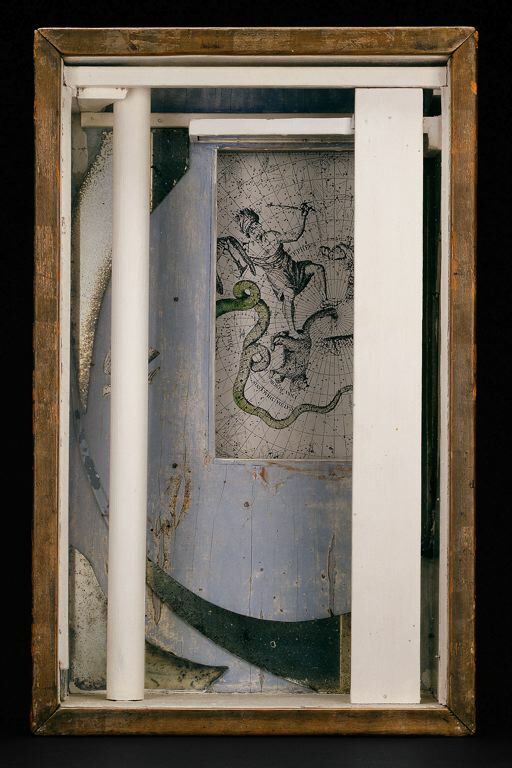 The aspect that set the whole work off for me was the vitrine-like frame around the interior objects. This enclosing, museological box initiated a deeper interrogation into the mechanics of the smaller boxes contained within; which in turn, created reciprocal dialogues of scale and the (in)accessibility to interior space. The structure of the outer box prompted me to think of preciousness, of the things we long to preserve, to contain, to separate, to keep hidden, to move or to share. The encounter with Filliou’s “permanent creation,” this box of boxes, also caused me to reflect more broadly on the nature of boxes and the fine lines separating them from other inanimate things, from the things they contain, transport, or put on display. A quick google image search for the word box unsurprisingly generates hundreds of banal images of plain wood and brown cardboard cubes, stamped with “fragile” and “handle with care;” objects existing to help you move and store other objects. Scattered amongst these results – besides an alarming number of cat-related boxes (litterboxes, how to make a hammock for your cat in a box, etc.) – was an image of Andy Warhol’s Brillo Box. Now leave it to Warhol to collapse so many complex concerns into such a tidy, seemingly straightforward thing. He gives us no access to the inside of his box. We only have the silkscreened surface, almost perfectly replicating the wrappings of a mass-marketed household product, and yet we know, either from looking at the object in front of us or by reading a caption/wall text, that this is a wooden box, clearly constructed and placed within an institution for the display of art. We are left then knowing or not knowing what is inside (nothing, structural armature, fun surprise, actual brillo pads…). 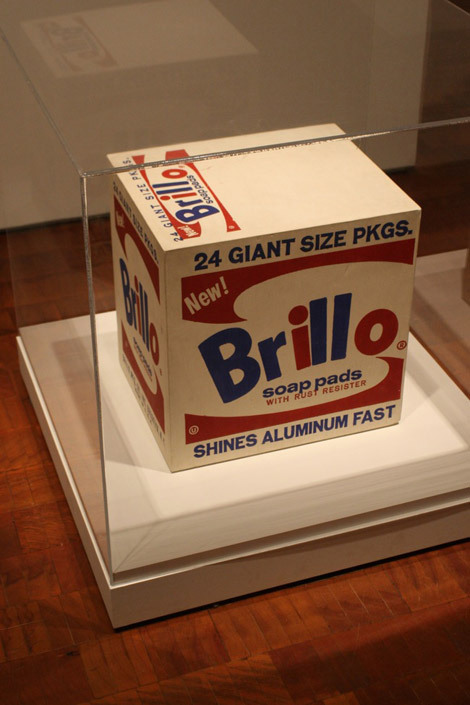 Warhol’s Brillo Box then is not just a box but also, depending on your inclination, a painting on a three-dimensional support or an outright sculpture. It crosses a threshold between a box significant only for what it contains and a box that is a thing in its own right. The history of art, both told and untold, is littered with boxes that operate in this liminal space, calling attention to its functional qualities while proclaiming its existence as sculptural thing: sarcophagi, reliquaries, decorative objects, cabinets of curiosities, and even the modern space of the museum gallery. Modern art has introduced us to Duchamp’s suitcases of miniatures, Cornell’s melancholy, cosmos of imagination, and the geometric, metal cubes of 1960s abstract sculpture. In these boxes, and the many more that could be included, there is an innate tension between the structure of the form and space or material in between its exterior boundaries. 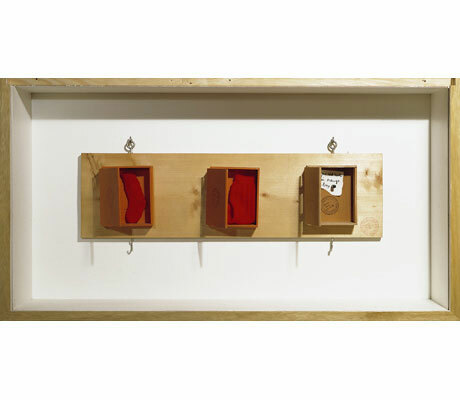 Contemporary art has plundered this tension, which could be understood as the distinctive characteristic of the box. 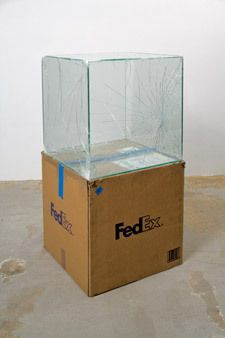 For example, Walead Beshty created glass sculptural cubes made specifically to fit into standard FedEx boxes, which he then shipped in said boxes around the world, displaying them together at their destination – the gallery exhibiting his work. 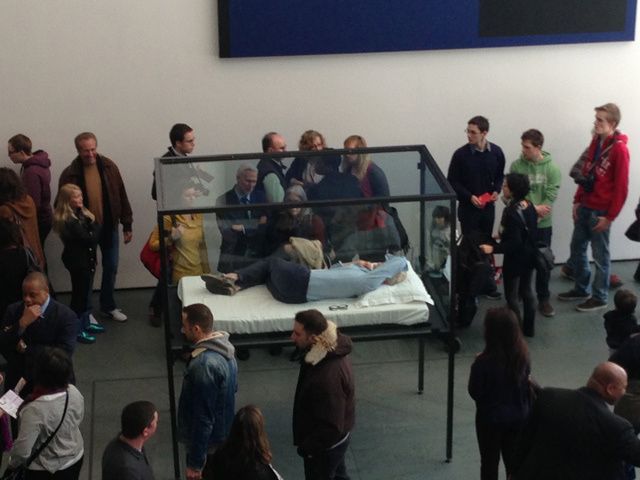 Or another, quite formally divergent example, the performance of Tilda Swinton at MoMA this past month, which involved the actress and her personal effects napping on a mattress within a glass vitrine. Though made with vastly different intents, both works relied on the structure and inherent tension of the box, which in both cases was crucially transparent. Tilda Swinton, The Maybe, 1995/2013. Performed at Museum of Modern Art, New York. 1 Robert Smithson, “A Sedimentation of the Mind: Earth Projects (1968),” in Robert Smithson: The Collected Writings, ed. Jack Flam. Berkeley: University of California Press, 2011. This is really well-written! Thank you! There’s actually an installation at the National Gallery right now called “The Box as Form,” so others do share your concerns! Oh I am so glad to hear the exhibition will be going back on view, Jennifer. I was disappointed when I checked the website this morning and it listed it as “past.” Hopefully I will be able to get to D.C. to see it. Who needs Durer when there are boxes to be looked into and around?! Thanks for the comment and for organizing a much needed show (the Judd quote over the doorway seems just perfect).